She studied under Engel in Paris and made her debut in 1919 at the Opéra-Comique in Paris. 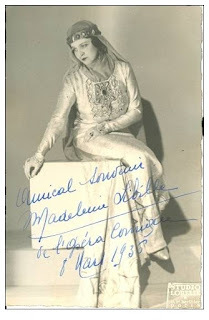 For more than twenty years she remained a member of this opera house and had her most important success in dramatic repertoire. At the Opéra-Comique she appeared in several operatic premieres: ‘’Lorenzaccio’’ of Ernest Moret (19. 5. 1920), ‘’L'Appel de la Mer’’ by Henri Rabaud (10. 4. 1924), ‘’Le pauvre matelot’’ of Darius Milhaud (16. 12. 1927), ‘’Le Peau de Chagrin’’ by Charles Lavadé (24. 4. 1929). In 1939 still there she appeared as the first dramatic soprano. Her repertoire included Santuzza in ‘’Cavalleria Rusticana’’, Charlotte in ‘’Werther’’ of J. Massenet, Carmen, Margared in ‘’Le Roi d'Ys’’ of E. Lalo and Tosca. Later she taught singing in Paris.